Jerusalem (AFP) - Israeli Prime Minister Benjamin Netanyahu on Thursday called corruption allegations a "witch hunt" meant to topple him after the attorney general announced plans to indict him. 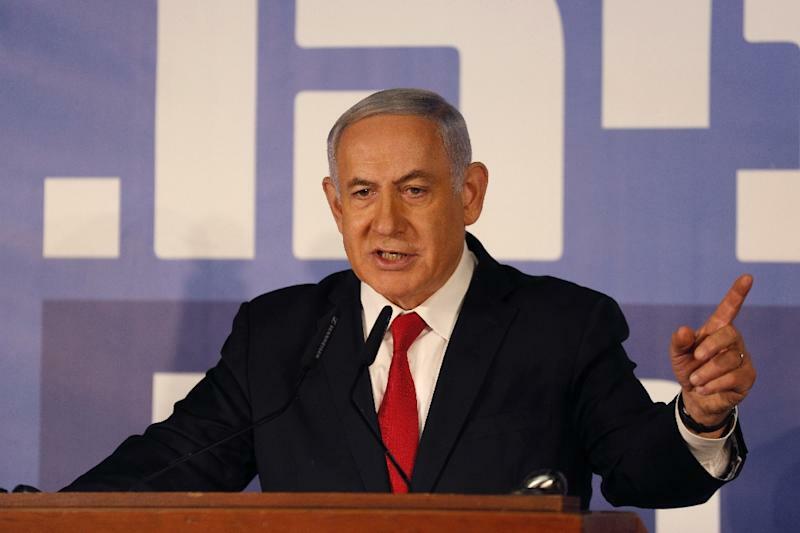 Speaking in a televised statement a couple of hours after the attorney general's announcement, Netanyahu said he planned on being prime minister for a long time to come despite the allegations. "The left knows it cannot beat us at the polling booth, so for the past three years they have been carrying out an unprecedented witch hunt which has one aim: to topple the right-wing government which I lead," he said. In the statement from his official residence that lasted about 20 minutes, Netanyahu's voice seemed to break with emotion as he spoke of his family, which he said had been smeared by the investigations. Standing before a campaign banner reading "Netanyahu Strong Right", he mentioned his relationships with US President Donald Trump and Russian President Vladimir Putin as being good for Israel. He alleged his political opponents "applied unceasing and inhuman pressure on the AG so that he would say that he is considering laying charges against me, subject to a hearing, even though it is clear that there is no substance". "The main thing was to influence the elections, even if we know that this house of cards will completely collapse after the elections," Netanyahu said. The attorney general's announcement comes ahead of April 9 elections in which Netanyahu is facing a tough challenge from a centrist political alliance led by a former military chief of staff, Benny Gantz. Attorney General Avichai Mandelblit said in a statement earlier Thursday that he intended to indict the premier for bribery, fraud and breach of trust pending a hearing, where Netanyahu would be given a chance to defend himself before charges are filed.